Over 4,000 students study at JCU Cairns, including about 380 international students. The campus location is spectacular – surrounded on three sides by rainforest-covered mountains. 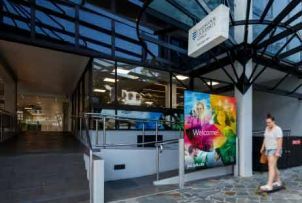 Located near the northern beaches in the suburb of Smithfield, the campus is 15 kilometres (9 miles) north of the city centre. Find out more on a guided tour of JCU Cairns.